It seems like every other day an upstart wireless service provider inks a wholesale deal with someone like Sprint or T-Mobile and effectively sells access to those big carrier networks under a different banner. And every other day, I ignore most of them, because they’re just so damned boring. Zact isn’t boring. In fact, Zact — an upstart service provider created by Andreessen Horowitz-backed ItsOn that uses Sprint’s network — has the best approach to wireless plans I’ve seen in a long time. Consider this scenario: you’ve signed up with Zact (no contracts here) and chosen a plan, say, 500 minutes, 1,000 text messages, and 1GB of data. That plan’ll cost you just shy of $40, and once you’ve signed up, you use the plan just as you would any other. At the end of the month though, it becomes apparent Zact’s approach flies in the face of how more traditional carriers handle billing. While carriers like AT&T, Verizon, Sprint, and the like are happy to keep quiet and accept your money for minutes, messages, and data you haven’t even touched, Zact goes back and credits you the difference between what you’ve paid for and what you’ve used. Yes, these people are actually trying to build a business by giving your money back to you. Now as neat as that is, that sort of no overage approach isn’t exactly new — MVNOs like Ting have been running with that model for over a year a now. Zact manages to take things a bit farther than Ting thanks to some interesting feature-centric plans for people who don’t need gobs and gobs of data each month because they only need to do a few things. 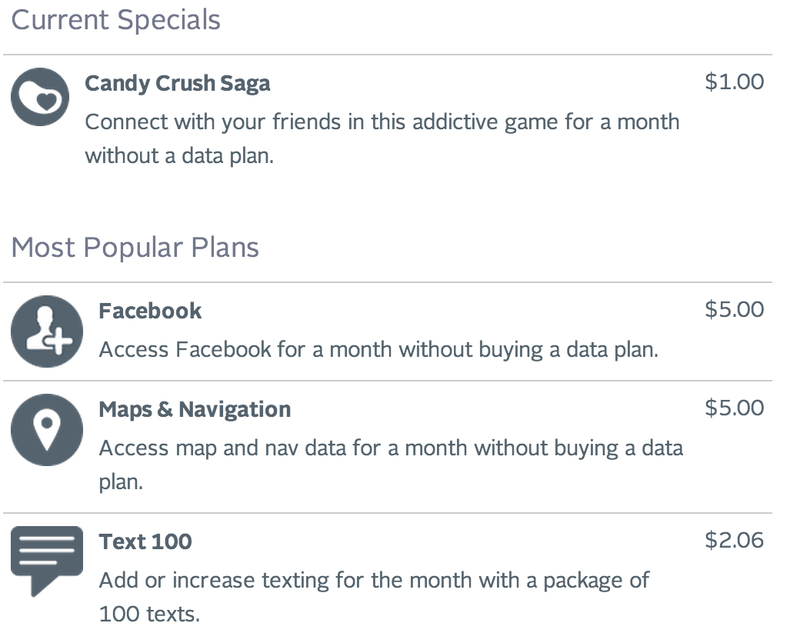 Take Facebook for instance: Zact offers a $5/mo feature that offers unlimited access to the social network that bars users from using the data connection for anything else. After all, some people may never use their smartphone for anything else anyway, so why charge them for all the extra cruft? Mixing and matching features is certainly more work than what most carriers have us doing now, but I’d much rather have the option at least. Users can also tweak those plans by way of some deeply-integrated Zact software with a surprising level of granularity at any point during the month, and those changes go into effect immediately — no chatting with customer service drones required. Those plans are intrinsically shareable too so if you and four friends can scrape by on 200 minutes a month, well, feel free. Getting close to your minute or message limits? You’ll be notified while you’re gabbing on the phone or when firing up the messaging app respectively. Throw in some savvy, instant-on parental controls (you can remotely disable apps on other devices on the account if you’re an admin) and you’ve the makings of a very promising service. The folks Andreessen Horowitz and seem to agree, as they collectively pumped some $15 million into Zact parent company ItsOn last October. Curiously, ItsOn’s ambitions extend beyond just running its own MVNO (except they really don’t like it when you call Zact the “m” word). CEO Greg Raleigh told TechCrunch that the cloud services that make those on-the-fly plan changes and suggestions possible has garnered ItsOn attention from carriers around the globe, a few of which can be found right here in the States. According to Raleigh, the vision isn’t so much about giving all those carriers a run for their money, it’s about getting them to adopt the same sort of granular approach to plans. Ah, but there’s a catch (isn’t there always?). As a Sprint wholesaler, Zact only has access to two Android smartphones (well, three if you count a color variant) right now, and either of them are terribly eyecatching. Ting is a slightly more attractive option right now if only because of the wider array of hardware available, but I’ll be keeping my eyes on ItsOn and Zact — they’re definitely on to something here.